Historically, dry cleaning facilities have been hotbeds for subsurface contamination due to the solvents used in the dry cleaning process. Chlorinated solvents are the chemicals most associated with dry cleaners and their environmental impact, namely perchloroethylene (PCE, or “perc”) and trichloroethylene (TCE). Living near a former or current dry cleaner can be a concern if the soils or groundwater are contaminated by these solvents, due to the potential for vapor intrusion from off-gassing PCE/TCE. Walden touched on vapor intrusion in a previous blog, which can be found here. As of March 10, 2018, 6 NYCRR Part 232 (Part 232), which regulates dry cleaners within the state, has been amended in order to stay current with federal standards. Dry cleaners using PCE/TCE or alternative solvents (defined by the New York State Department of Environmental Conservation (DEC) as “any solvent, other than perc, used as the primary solvent in a dry cleaning machine”) are subject to this regulation. However, those using water-based or liquid carbon dioxide cleaning processes are exempt from Part 232. PCE/TCE dry cleaning machines may no longer be installed in residential buildings. Any existing PCE/TCE dry cleaning machines must be removed from all residential buildings by December 21, 2020. Additionally, to remain consistent with the dry cleaner industry, all machines that are not expressly approved by the DEC must be issued a “Statement of Compliance” by the manufacturer or manufacturer’s representative. The Statement of Compliance assures that each piece of equipment is acceptable to the state with respect to solvent regulations. For all machines that use alternative solvents as defined above, operator self-monitoring and operation & maintenance protocols have been established in the regulatory update. In addition, there are new manufacturer testing requirements that are specific to alternative solvent machines. To reduce Volatile Organic Compound (VOC) emissions, all alternative solvent units that require manual transferring of clothing from one unit to another will be phased out by the end of 2031. 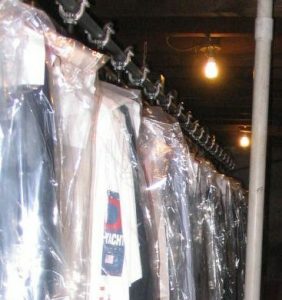 Walden has a team of engineers and scientists with thorough experience in remediation of dry cleaning sites. In addition to remediation work, Walden also specializes in commercial air permitting and compliance, also required by the DEC. Please give us a call today at (516) 624-7200 to learn more!